Scary Terry's World: More commissions! Okay, I know I said I wasn't doing any more of these for a while -- but I didn't count on having a little down time in between sections of Return to Perdition. So, I did these two in between pencilling the first eighteen pages of that project and starting to ink them -- and just before getting ready for FallCon. The show is tomorrow and Sunday -- I'm sorting through art and comics to bring to the show tonight, so I'll present these with a brief description and get back to the sorting. 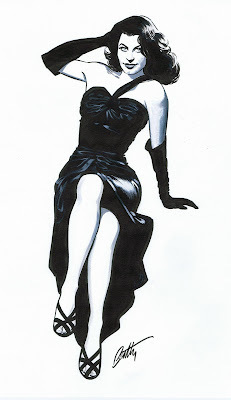 First up is a B&W pin-up drawing of Ava Gardner. This is based on a combination of elements from several different reference photos, and was a real treat to do. It's a mixed media piece -- ink on paper with shading and dress details in acrylic. Below Ava is another Huntress team-up image for a client who is obviously a big Huntress fan! This time she is ready to fight crime with the Robin of Earth 2. That's it. See you at FallCon!!!!!! Wow, love that Ava Gardner! The top one's a stunner , nicely done. 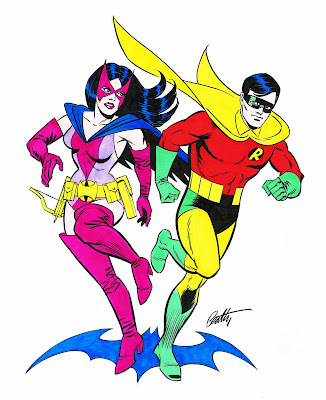 I remember that Robin costume when Neal Adams drew it way back when. I've always loved that, wished DC had put Earth one Robin in it. Love seeing your commisions, Terry! The Ava Gardner is excellent!